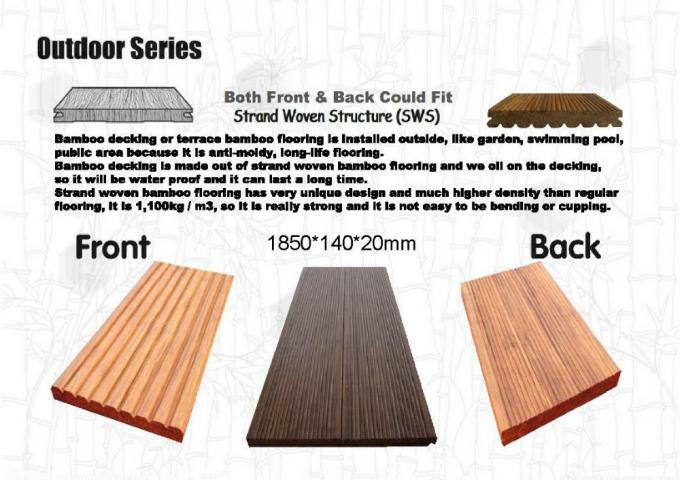 Bamboo decking or terrace bamboo flooring is installed outside,like garden,swimming pool,public area beacause it is anti-moldy,long-life flooring.Bamboo decking is made out of strand woven bamboo flooring and we oil on the decking,so it will be water proof and it can last a long time.Strand woven bamboo flooring has very unique design and much higher density than regular flooring,it is 1100/m3,so it is really strong and it is not easy to be bending or cupping. a.It costs much less than your typical hardwood flooring material. b.Extremele durable(73% harder than Jarrah). c.it is not moisture resistant as well as beling termite proof. d.Giving your home an innovative new style while adding aesthetic value to it at the same time. 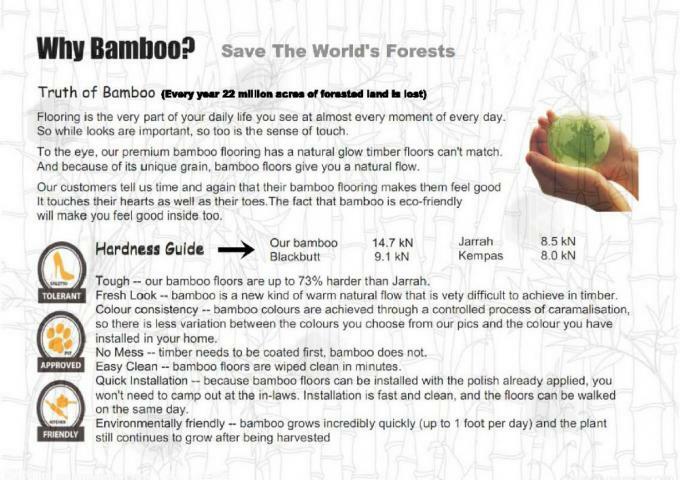 e.bamboo is considered be eco-friendly becasue it takes much less time to grow than other hardwood trees. No matter its Aesthetics, Properties or Environmental Benefits or price. It has all the unique advantage to gain fast popularity across the European, North America, Asia and other countries. 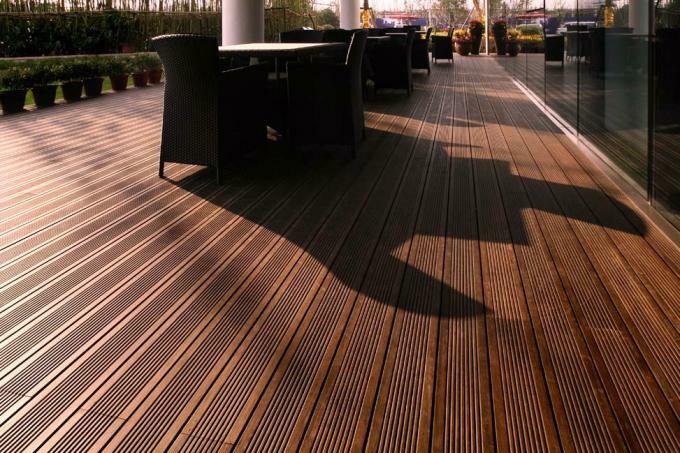 there are various sorts of flooring catching clients’ eye day by day, such as hardwood floor, engineered wood floor, floating floor, wood floor and so on. 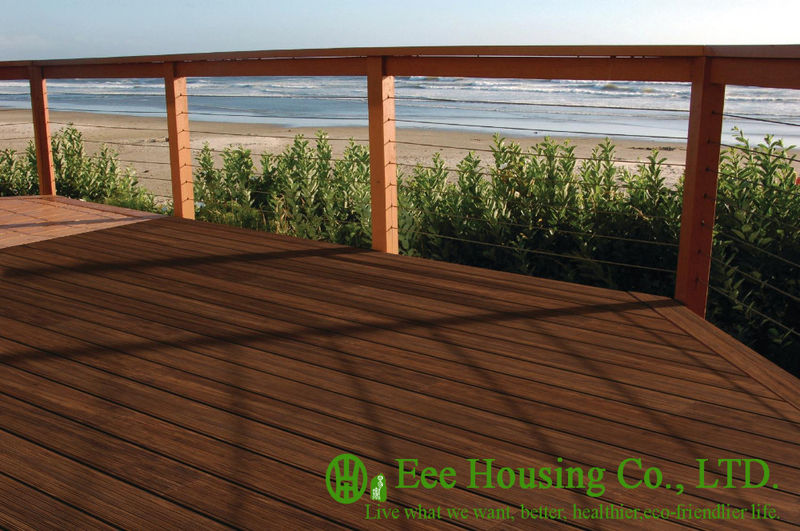 Bamboo decking is ecofirendly type flooring, With its own fucntion of waterproof,UV protection,anti-skidding,it's used for many outdoor erea,such like gardon,terrance,swimming pool and so on.It looks more ''Green",and make people feel confortable than wooden decking.If you want to select high qulity and competitive pirce ,bamboo decking would be your best choice.